Where would you be without your boat trailer? Good luck getting your favorite possession out on the water without a functioning boat or Jet Ski trailer. Individuals take their trailer for granted until it gets damaged and taking your boat or Jet Ski on and off the water is an added hassle or worse, its stranded away from the water! Accidents happen, and boat trailers need fixing. If you live in the St. Paul or Minneapolis area, there is no need to stress if your trailer is damaged because Anchor Marine Repair is right around the corner, ready to get your boat or Jet Ski trailer running like normal. At Anchor Marine Repair, we take the relationship that we build with our customers very seriously. That may be the reason why we are Minneapolis’ number one boat repair shop. Over the years, we have developed a drive for helping individuals with the same passion as us, boats! Our extensive team has over 45 years of combined experience, and each specialist has been on staff for at least 10 years. There are not many companies of any kind that can say the same. Our work doesn’t stop with boats. 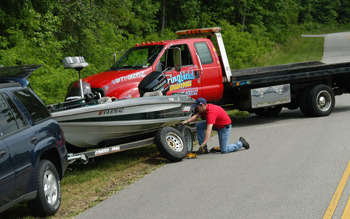 We offer diverse repair services including boat trailer repairs. Thanks to our 10,000 square foot facility, we can have your trailer in and out in no time so that you can enjoy the remaining good weather we have on the horizon before the cold temperatures return. Providing St Paul and Minneapolis boat trailer repairs, Anchor Marine Repair is eager to serve you. If you are in need of quick and reliable trailer repairs, give us a call today at (763) 972-3540 to request a free estimate.